1. Display advanced tray hint when you roll mouse over the tray icon. 2. Display time spent for all projects in the advanced hint. 3. Display time spent for selected projects in the advanced hint. 4. Display time spent for selected tasks in the advanced hint. 5. If this option is on, display time of selected projects and tasks. Otherwise, display time of active project and task. 6. If this option is on, the tray icon will be always displayed. Otherwise the icon will be displayed only if the application is minimized. 7. Select action on left-click on the tray icon. 8. 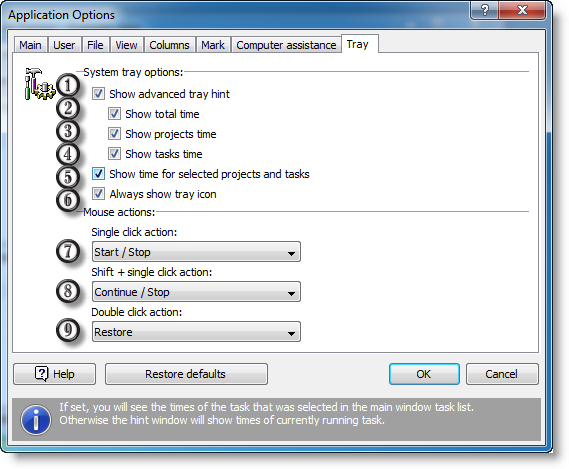 Select action on Shift + left-click on the tray icon. 9. Select action on double-click on the tray icon.